Little kids have small nasal passages making them susceptible to sinus problems, coughs, colds, flu, hayfever and asthma. Often this makes it very hard for the child to get to sleep and stay asleep. We all know what it feels like to lie down and try to sleep when you are coughing or can't breathe through your nose, it's awful. This leads to an upset and not sleeping child and therefore parents who are also not able to sleep. A terrible experience for the whole family. Even if the child does get to sleep the snoring and blocked nose noises that their child is making really worry parents that the child is not getting enough air in. There are a couple of things you can do to assist with these problems and to aid a better nights sleep for the whole family. No medication necessary. A rolled up towel and some steam could be all the unsleeping child needs. First tip is to: Prop up your child's bed: This is particularly effective if done from the top part of the bed (where the pillow would be) till about the middle of it. Making the mattress lay at a slant rather than flat on the slats. This is easy to do and you can do it with things you already have at home. Prop up the child's bed using: some pillows, cushions, a rolled up towel, blanket or even a rolled up yoga mat. Now all you have to do is lift up the mattress and place whatever you are using from the list above underneath it near where they lay their head. Now lay the mattress back down and adjust it so that the top of the mattress is at a slight slant. Not too much as otherwise the child could just slide down it and you don't want them to notice too much of a difference. Done, super easy to do, really helps and doesn't have to cost a thing. The second tip I have is to use steam: in the child's room. This can be done by purchasing a vapouriser online or at a pharmacy they are around $50 but they are worth every penny. You fill it up with just normal tap water, add some essential oil, eucalyptus is perfect and plug it in. In a few minutes it will boil the water and disperse the steam around the child's room. Most of them will ran for up to 8 hours continuously. The steam is a natural and safe way (as long as the child doesn't touch it) to help open up the airways and nasal passages. The eucalyptus oil is great for this also with the added bonus of creating a calming effect, perfect for sleep. Recall how sleepy koalas are, that's why. If you don't wish to buy a vapouriser then you can also just simply use your kettle to boil water with a bit of the oil mixed in, in your child's room. This won't last as long but it should help if you are really stuck. These simple yet effective tips have really helped my son particularly through the spring and winter months. Give it a go, I hope it helps your children too. Your right Lucy that really helps too. Do you find that the vapouriser makes the walls and windows in the room wet though? I find this a bit annoying. We use that exact vaporiser whenever the kids have the snuffles/coughs, and I am always surprised at how much of a difference it makes. Also, rubbing vicks directly onto their chest helps a lot too. great tips! 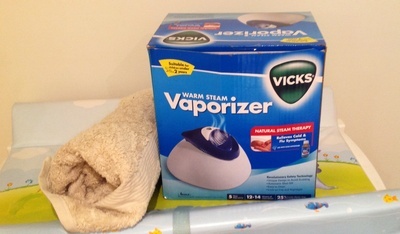 When my eldest had croup, using steam was invaluable.